Home BUSINESS DCI overwhelmed by Ekeza Sacco fraud complaints, postpone probe. DCI overwhelmed by Ekeza Sacco fraud complaints, postpone probe. Ekeza Sacco members scamper for safety after police lobbed teargas to disperse them on Kiambu road on Monday. Detectives collecting evidence on the Sh1.5 billion Ekeza Sacco fraud on Monday were forced to postpone the exercise after being overwhelmed by the high number of complaints. About 15,000 Gakuyo Real Estate, Ekeza Sacco and Gakuyo Investment Club members from Nairobi had reported at the DCI Headquarters along Kiambu Road to lodge official complaints over their loss of money with these trouble entities. 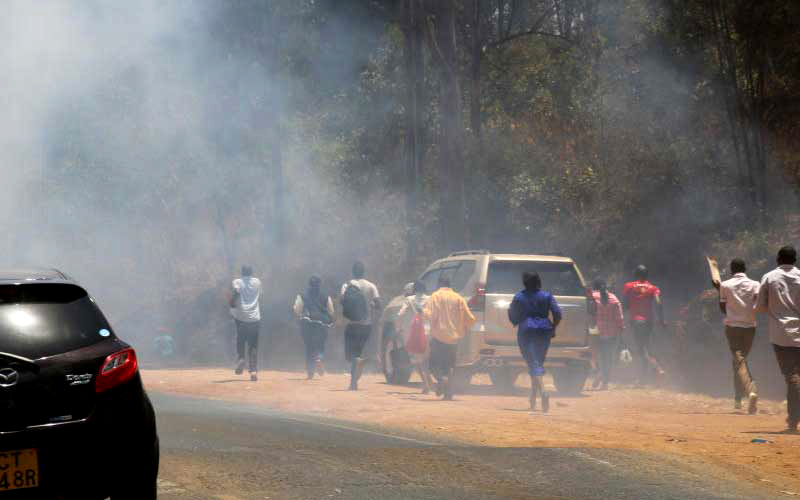 The cancellation of the exercise elicited ugly protests by the angry victims of the probe who resulted to blocking a section of Kiambu road, prompting the police to lob teargas to disperse them. The members had complained of delay in service, forcing them to barricade the roads in a bid to paralyse activities until they were attended to. The DCI had called on all Ekeza Sacco members from Nairobi and Kiambu counties to avail themselves, with both counties estimated to host at least 60,000 members. In a letter dated March 13, 2019 signed by John Kariuki on behalf of DCI boss George Kinoti, said his office has received numerous fraud complaints touching on the three organisations. “To further our investigations in to the matter, the general public who have been defrauded in the scheme and hail from Nairobi and Kiambu counties are advised to report to the DCI headquarters along Kiambu Road on March 18,2 019 at 9am,”reads part of the letter. Members started streaming to the DCI headquarters as early as 4am and by 9am, hundreds had already queued outside the gates. About an hour later, a team of officers came out and directed the crowd to record their details in forms they provided and they were to enter in groups of 10, to write their names, phone numbers and the amount of money they lost. Some of the more restless in the crowd started fighting for the forms, which prompted the officers to ask those from Nairobi County to go home, assuring them that they would be given a new date to register their details.